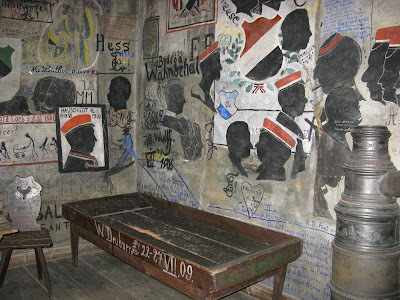 As long ago as the 16th century, citizen complaints about carousing students led the university of Heidelberg to open a Studentenkarzer (student prison) where academic miscreants were kept off the streets for three days to four weeks at a time. Up to 1914, students were imprisoned for so called 'Kavaliersdelikte' such as excessive drinking at night, insulting official authorities, womanising, participating in duelling, and setting the townspeople's ubiquitous pigs free. 'Kavaliersdelikte' were kind of fashionable for these otherwise honorable gemtlemen, most of them being members of student fraternities. Student prisioners were allowed to attend lectures. After classes, the juvenile delinquents had to return to jail. Instead of freeing pigs students turned to become artists leaving behind paintings of student scenes and poems (now called graffiti in public buildings....). Photo from Heidelberg, Germany, December 2008.